Autumn is in the air–so why not celebrate the bounty of the season from an Indiana orchard like Highpoint Orchard in Greensburg, Indiana? Highpoint Orchard is more than an orchard, it’s also cafe, event hall, and meeting space! Situated on historic Pleak’s Hill, Highpoint Orchard has transformed the area into a bustling gathering space in a very nice Indiana town. little Indiana and family had the great good fortune of enjoying lunch at this scenic point. Three words: Fresh, fresh, and fresh! Everything on the menu is freshly prepared–and you can taste the difference. What did we order? Well, it was certainly hard to decide! The kids were easy enough: Kid #1 wanted a burger and Kid #2 got a peanut butter and jelly sandwich. Hubs and I waffled. I finally decided on the popular Chicken Salad on a Croissant with the Orchard Salad–pecans, cran-raisins, feta cheese, blueberries and peaches under a pretty pink raspberry vinaigrette dressing. Lovely! 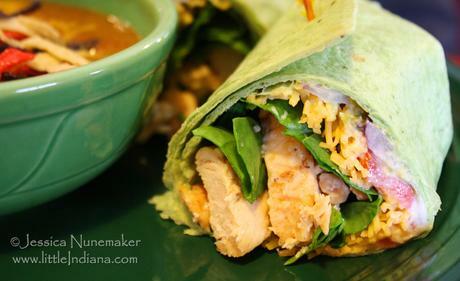 Hubs got the Chicken Avocado Wrap which was a thing of beauty: Chicken and avocado with cheese, red onions, tomatoes, and greens. YUM! Dessert? This IS little Indiana! But you’ll have to stay tuned to read all about that one. 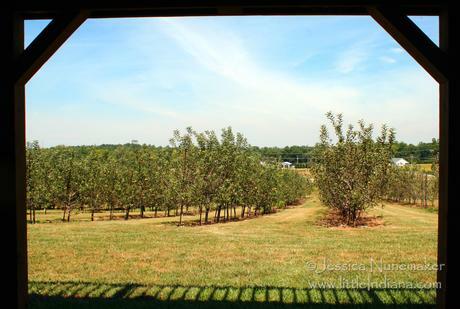 Let’s not get so distracted by the mouth-watering food that we forget a key part of this Indiana orchard–the orchard! Rows and rows of various fruit trees surround the property. It’s beautiful. I can easily see small weddings, graduation, or anniversary parties taking advantage of the great photo opps. Highpoint Orchard has plenty of big ideas in the works to add on to the already big list of things they have successfully accomplished! Renovating a historic home is hard enough–through in outbuildings and an orchard and it’s amazing what they’ve done. Go there for lunch, grab one of the neat gifty items to treat a friend, and don’t forget to bring home some fresh fruit! 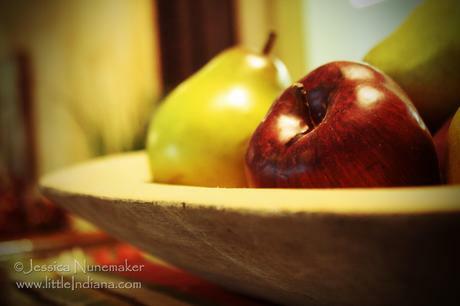 We sampled an assortment of apples and pears–trust me, you won’t want to leave empty-handed! See more Highpoint Orchard images and other pictures in Greensburg, Indiana on my Flickr photostream. Special thanks to Melanie Maxwell with Visit Greensburg for footing our bill. As always, my opinions remain mine and mine alone. New! Offering affordable online advertising for your small Indiana business! little Indiana Businesses is the online presence that you’ve been looking for.